The kingdom Denmark (Kongeriget Danmark) is situated in northern Europe, a peninsula north of Germany, bordering in the west the North Sea, in the north the Skagerrak and in the east the Sont and the Baltic Sea. Next to the two large islands Sjaeland and Fyn there are almost 500 small islands of which more than a hundred are inhabited. The surface is about 42,000 square km, a little bigger than Holland. The coastline is 7314 km. long thanks to the many bays and fjords. The border on land with Germany is only 68 km. long. 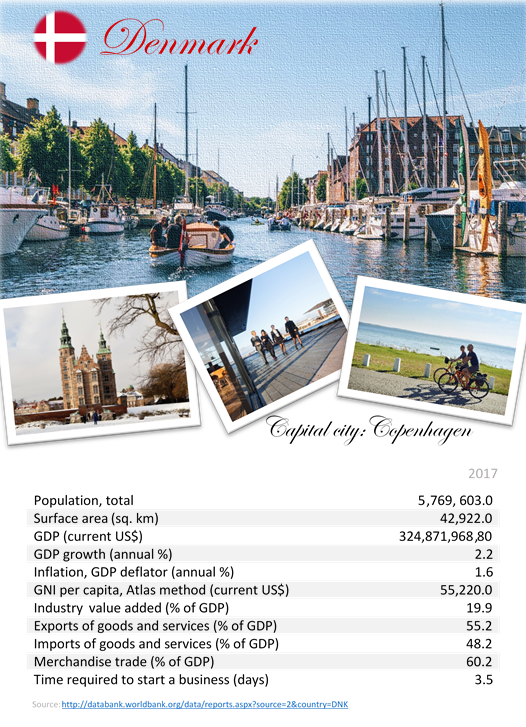 Denmark has 5.3 million inhabitants. The Faroe islands and Greenland also officially belong to the Danish kingdom. Situated in the heart of the Gulf Stream in the North Atlantic, the Faroe Islands lie northwest of Scotland and halfway between Iceland and Norway. The archipelago is composed of 18 islands covering 1399 km2. There are 1100 km (687 miles) of coastline and at no time is one more than 5 km (3 miles) away from the ocean. Since 1948, the Faroe Islands have been a self-governing region of the Kingdom of Denmark. It has its own parliament and its own flag. It is not, however, a member of the European Union and all trade is governed by special treaties. It has 48,000 inhabitants. Greenland is the largest island of the world with a surface of 2,175,000 km2, of which 340,000 km2 free of ice. It is situated northeast of Canada and has about 56.000 inhabitants. The highest point of Greenland is 3700 meters. 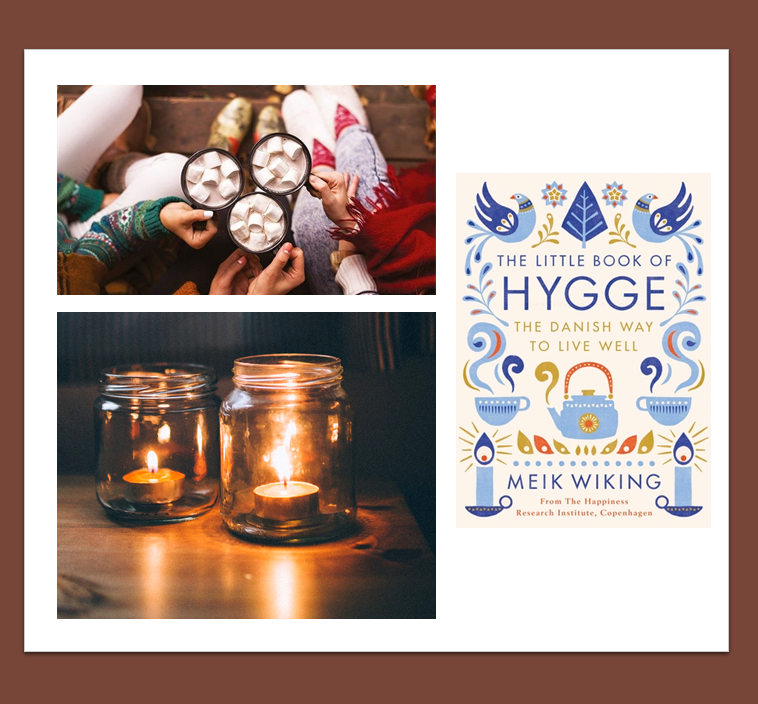 Hygge is as Danish as æbleskiver and it goes far in illuminating the Danish soul. In essence, hygge means creating a warm atmosphere and enjoying the good things in life with good people. The warm glow of candlelight is hygge. Cosying up with a loved one for a movie – that’s hygge, too. And there’s nothing more hygge than sitting around with friends and family, discussing the big and small things in life. 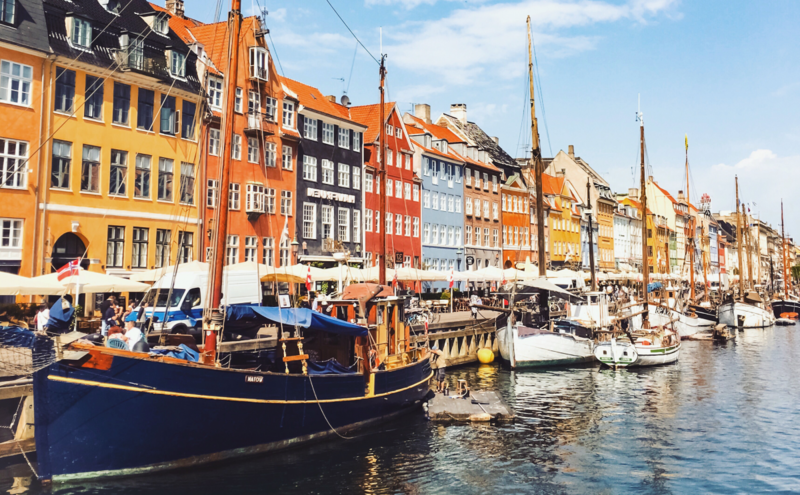 Perhaps hygge explains why the Danes are some of the happiest people in the world. But don’t take our word for it; see for yourself.